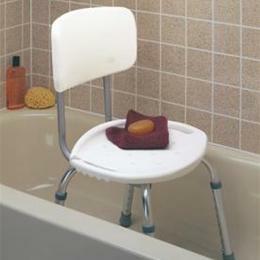 These seats can be used in a bathtub or shower stall. Also available with a back for added comfort. The seat and back are constructed of durable plastic with easy-to-grip handles and molded-in areas for hand-held shower spray storage. The aluminum legs are flared to help prevent tipping. Slip-resistant rubber tips grip shower floor.